Fuji heavy industries and Rockwell International joined forces to manufacture a seven-passenger pressurized twin that will be called in the US - the Rockwell Commander 700. But in order to compete directly in the American marketplace, Fuji needed a dealership organization that could both sell and service the airplane. Rockwell's problem was their Aero Commander basic design of 30 years had run out of growth potential. The resulting agreement: Fuji builds the airframe, wings and tail assembly in Japan, then ships them to Rockwell's Oklahoma plant, where they are assembled and fitted with engines, landing gear, interiors and other American-made components, which make up approximately 80 percent of the complete airplane. The design is certificated in both countries; Fuji will market the airplane in Australia and Asia, while Rockwell, through its dealer network, will sell the Commander 700 in America and Europe. The first of five flying prototypes of the Fuji FA-300/Rockwell Commander 700 made its maiden flight at Utsonomiya on 13 November 1975 and the first flight in the U.S. was in late February 1976. Three airplanes were involved in U.S. certification, and two in a companion program in Japan. The Rockwell Commander 700 was certified by Japan in 1975. It features two 340-hp turbocharged Lycomings. First deliveries of the 700 were scheduled for February 1977. The 700 is a pressurized piston twin powered by two Lycoming TIO-540s that put out 340 horsepower at 2,500 rpm and have a TBO of 1,800 hours; they're geared and turbocharged and are much the same engines Piper uses in the Navajo Chieftain. Their cooling is updraft, with air exiting out the up-per rear of each nacelle through a single motor-driven cowl flap that opens inward. Each wing carries 624 pounds of fuel in a single tank that supplies gas directly to its respective engine. The remainder of the fuel system is comprised of two shutoff valves, a single cross-flow valve for emergency situations and two boost pumps. Pressurization was 5.5 psi, for a 5,000-foot cabin at 20,000 feet. The cabin is large-360 cubic feet including 53 cubic feet for baggage in the pressurized area. On the first flight, a cruising speed of about 200 knots was attained at 10,000 feet. Preliminary figures indicate a top speed of 240 knots at 20,000 feet. Total fuel capacity will be 190 gallons, for an en-durance of about five hours. The airframes will be fabricated in Japan and shipped to Rockwell's Bethany, Oklahoma plant. Engines, systems, accessories, avionics and interiors will be in-stalled there as the airplane is assembled. Eighty percent of the total aircraft will be of U.S. manufacture. Development of the airplane started in the mid 1960s, with Rockwell entering the picture in the early 1970s. The specifications were refined, discussed and negotiated, and an agreement as to the final design for the 700 was reached in June 1974. The airfoil section was designed by Fuji and combines with an efficient flap system to produce a relatively low stalling speed in spite of a relatively high wing loading. The 700 has 200 square feet of wing area and the projected gross weight is 6,800 pounds. An extensive wind tunnel program was conducted on the design. Engine-cooling drag has been minimized, and extensive use of metal bonding has resulted in smooth surfaces. 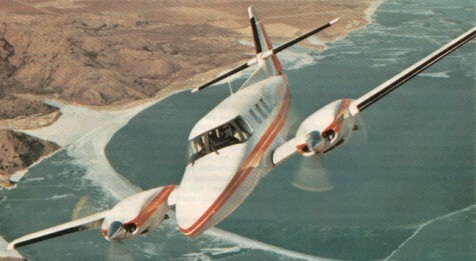 Rockwell and Fuji Jet Industries terminated their agreement on the Commander 700 in December 1979. Engines: Lycoming TIO-540-R2AD, 340 hp at sea level. Props: three-blade, constant-speed, 81-in diameter. Length: 38 ft. 2 in. Height: 13 ft. 4 in. Payload with full fuel: 762 lbs. Usable fuel capacity: 208 USG/1,248 lbs. Maximum landing weight: 6,600 lbs. Maximum rate of climb: 1,633 fpm. Single-engine rate of climb: 273 fpm. Single-engine climb gradient at 101 kts. (Vyse): 256 ft/nm. Single-engine service ceiling: 12,000 ft.
Max cruise, 75 % power at 24,000 ft: 218 kts. Econ cruise, 65 % power at 16,000 ft: 190 kts. Duration at max cruise: 5.9 hrs. Duration at econ cruise: 6.8 hrs. Stalling speed, clean: 85 kts. Stalling speed, full flaps: 67 kts. 10,000-ft. cabin at: 26,000 ft.
Max SL cabin alt: 12,500 feet.